Conductive Hearing Loss- Conductive hearing loss occurs when sound is not conducted efficiently through the outer ear canal to the eardrum and the tiny bones (ossicles) of the middle ear. Conductive hearing loss usually involves a reduction in sound level or the ability to hear faint sounds. This type of hearing loss can often be corrected medically or surgically. 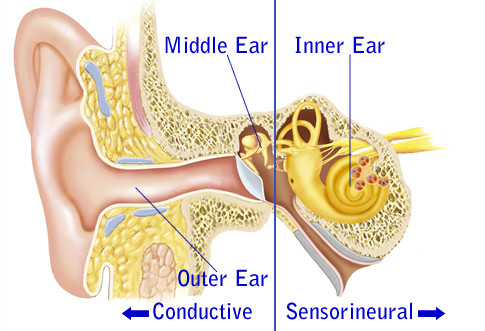 Sensorineural Hearing Loss- Sensorineural hearing loss (SNHL) occurs when there is damage to the inner ear (cochlea), or to the nerve pathways from the inner ear to the brain. Most of the time, SNHL cannot be medically or surgically corrected. This is the most common type of permanent hearing loss. Mixed Hearing Loss- Sometimes a conductive hearing loss occurs in combination with a sensorineural hearing loss (SNHL). In other words, there may be damage in the outer or middle ear and in the inner ear (cochlea) or auditory nerve. When this occurs, the hearing loss is referred to as a mixed hearing loss.